Bed bugs are parasitic insects of the cimicid family that feed exclusively on blood. Bed bugs prefer to hide in cracks and crevices during the daytime and come out to feed on the host’s blood at night, usually while the host is sleeping. 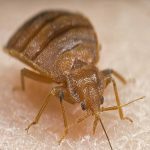 There are several methods to control bed bugs. Natural products found at most stores. The pest control operator will usually give you specific instructions to prepare for an inspection or treatment. Diet: Blood from any warm-blooded animal. Their most common targets are humans because, unlike animals with fur, we have a lot of exposed skin for them to bite. Habitat: Typically found in beds and small cracks and crevices. Impact: When feeding, they inject the skin with their saliva (this keeps the blood from clotting) and an anesthetic (this keeps the host from feeling the bite and moving). Bed bugs do not spread disease, but their bites can become red and bites itchy. Wash all of your clothes from a return trip/holiday including those that have not been worn. Use hot water to ensure that any bed bugs that may have made it that far are not placed into your drawers/closet. They are hard to see, so if you think you have bed bugs, call a pest management professional.